Tulipa kaufmanniana (Tulipa kaufmanniana): growing, planting, caring. A group of tulips with brightly contrasting colors. Full description for Tulipa kaufmanniana not yet available. In autumn, repot 3-4 bulbs of tulip per pot then cover with 10 cm of potting soil. To plant spring bulbs outdoor: Dig deep, remove any weeds and pebbles and incorporate some peat and sand into the soil. Planting: the depth of the hole depends on the size of the bulb you want to plant (eg about 5 cm for crocus, snowdrops, muscari, anemones, 8 cm for buttercups and 10 cm for tulip, narcissus, the lily, the freesias). In any case, the depth must be equal to two and a half times their height. Help yourself with a bulb planter, it is graduated and therefore very practical: sink it in the ground until the desired depth, remove it (it carries the ground with him); - Place the bulb at the bottom of the hole, point upwards. You can put a small layer of sand at the bottom of the hole so that your bulbous plant always has dry feet. - Cover with earth: spread the planter that releases the soil he had carried away. Finish with a good watering. Planting spring bulbs indoors: In pots or in a tray (crocus, daffodils, tulips, amaryllis, hyacinth), plant the bulbs tightly against each other to obtain a mass effect (with the exception of the amaryllis which requires a pot large enough and must be planted alone). Do not cover them completely and let the tip emerge from the soil. Water regularly. 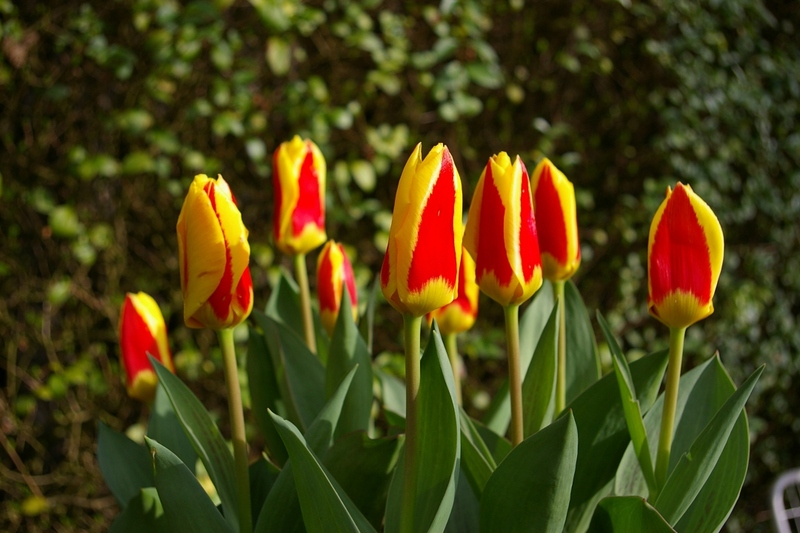 It may be necessary, when growth begins and during flowering, to sprinkle copiously the tulips-in a well-drained soil. For potted bulbs and indoors, water weekly during the growing season. Do not water after the flowering. Wait until your tulips are well faded because it is at this moment that they stock their reserves for the following year. Cut leaves and stems only when they are yellow: if you remove the foliage just after flowering, they may not bloom again the following spring.